Mike Westgate. Photo courtesy of: Mike Westgate Sound Ltd. Suddenly I was sinking in sticky, smelly mud almost up to my knees. All by myself, not being able to move, I thought of my few options... In the quick moment of panic, I had one thought: I must successfully save my Fluffy, my precious microphone cover everyone has nicknamed. The team spends Day 13 on Laysan Island, where they observe much about the abundant birdlife. They're shown consolidated corals that form nesting areas for Bulwer's petrels and red-tail tropic birds. Beth points out dead albatross chicks with guts full of plastic, an all-too-common sight here. They also check out the guano hard pan, a fertilizer-mining site from a hundred years ago, which is a popular nesting area for the Laysan albatross, who now number just over 100,000, down from nearly twice that number in only five years. U.S. Fish and Wildlife Service biologists take team members on a tour of the island's vegetation, which was devastated by rabbit farming in the 1920s. Fortunately, restoration efforts have come a long way in restoring the island to its native condition. Chief diver Blair also goes for an exploratory dive in the island's shallow saline lake, where he finds thick concentrations of shrimp, both swimming in the water column and dead in layers on the bottom. Another day in the field. As I was recording atmosphere and bird sounds on my own, just after we had all finished filming at the 100-acre saline lake on Laysan Island, I started making my way back to the group when I noticed the ground beneath my feet getting softer and softer. Suddenly I was sinking in sticky, smelly mud almost up to my knees. All by myself, not being able to move, I thought of my few options. Just then, Antoine and Tove noticed me from the distance and started running toward me just as I was able to break through from the mud. In the quick moment of panic, I had one thought: I must successfully save my Fluffy, my precious microphone cover everyone has nicknamed. I have really enjoyed recording the variety of birdcalls from the nesting colonies of Tern and Laysan islands. The interesting thing with birdcalls is that you are put in a place that is strange to you and you have to develop an expert awareness so you can research and record as many calls as possible for the production team's support. On Tern Island, because the bird life is concentrated with many species nesting in close proximity, it was challenging to single out one species from another. Once I was back on the boat, I was able to isolate calls within reasonable limits, identifying certain calls. 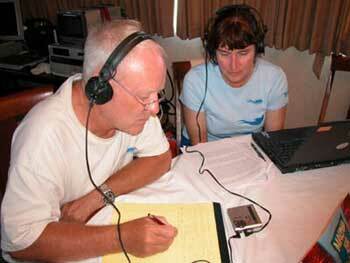 Then I sat down with our bird biologist, Dr. Beth Flint, and confirmed each track of bird sounds. For me, experiencing expedition life again after a 10-year gap -- the friendships, minor hardships and all the joys. What I miss on this trip is easy access to communication and resources, like the conveniences of the Internet. The last 10 years, we have become so used to quick communication with immediate response that I forget that I do not have at my fingertips an easy answer to the questions that come up. Trying to package my operating equipment without the normal organization of specific cases that I use for my mixer and recorder. Because of the quarantine on Laysan Island, I had to put the radio microphone into a modified plastic box and duct-tape the wires on the outside. It made it very cumbersome and awkward, walking around an island that is 1.2 square miles in 90 plus-degree weather and humidity. Talking amongst our dynamic team. There are so many wonderful stories to share. Page created 3-22-06. © 2006-2009 KQED and Ocean Futures Society. All rights reserved.